Institute of Archaeology, who surveyed and recorded over 1500 trees with members of Museum of London Archaeology’s Geomatics Department. 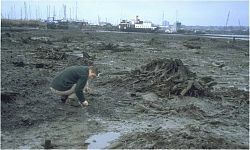 Since then, Jane Sidell and English Heritage have regularly visited the site, where the remains of a well preserved palaeolandscape are exposed during low tide. The site is huge, and if you are interested in trees and ancient landscapes, then this is the site for you! The exposed layers date from the Neolithic to the Iron Age and the preservation is amazing; root systems and whole trees lie scattered over 1km of the foreshore. We were able to relocate ‘Rob’s Trackway’, (named after its original discoverer Robert Whytehead), and found that it was much more exposed than previously. This feature has been dated to the Bronze Age. A word of warning: access is very difficult. This morning we crossed mounds of modern rubbish, seaweed-covered rock armour and nearly got stuck in the mud at the top of the site….very rarely do I wear wellies but they are necessary on this site! 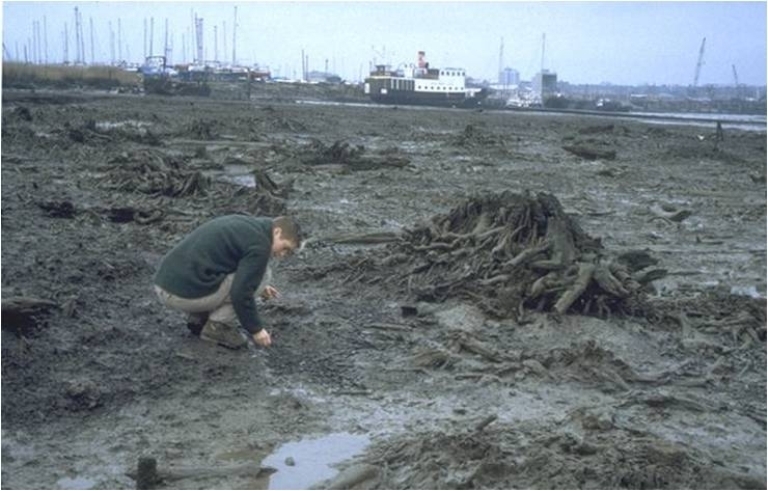 We didn’t get a chance today to visit the western part of the site, near the Erith Yacht Club, where there is more of the prehistoric forest and the remains of some vessels, but watch this space for future developments.